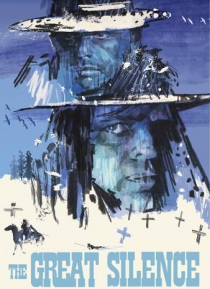 On an unforgiving, snow-swept frontier, a group of bloodthirsty bounty hunters, led by the vicious Loco, preys on a band of persecuted outlaws who have taken to the hills. As the price on each head is collected one-by-one, only a mute gunslinger named Silence stands between the innocent refugees and the greed and corruption that the bounty hunters represent. But in this harsh, brutal world, the li… nes between right and wrong aren't always clear and good doesn't always triumph.